This medicinal popular succulent is marketed as variously having rejuvenating, healing, or soothing properties. Fresh juice from the leaves acts as an emollient (skin-softener) and a laxative, and is used to treat minor wounds and burns. The juice is also used as a refreshing drink. Growing up to 1m in height, it spreads by offsets. The leaves are thick and fleshy, green to grey-green, with some varieties showing white flecks on their upper and lower stem surfaces.The margin of the leaf is serrated and has small white teeth. The flowers are produced in summer on a spike up to 90cm tall. It prefers a brightly lite position but in partial shade. Prefers warm climates and well draining soil. Frost tender but drought tolerant. 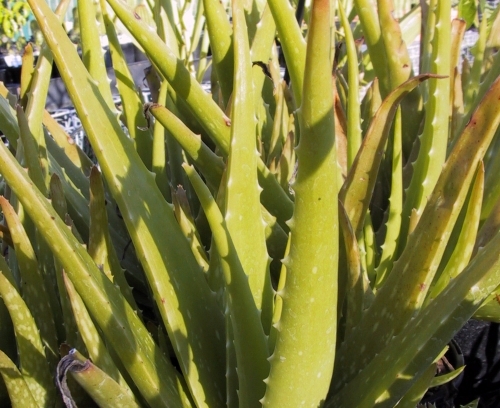 Common names: Chinese Aloe; Indian Aloe; Barbados Aloe; Burn Aloe; First Aid Plant.